A new control station for a gas pipeline is being set up in San Luis Potosi. The reinforced concrete frame supports of this control station are formed using the DUO lightweight formwork. 45 square supports of 2.00 m in height with edge lengths from 40 cm to 50 cm are to be installed. 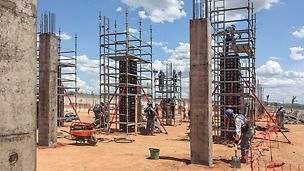 5 sets of formwork are mounted with 4 DUO Multi Panels DMP 75 each – connected by means of DUO Corner Connectors. A circumferential PERI UP working scaffold with a ladder access ensures safe working conditions. 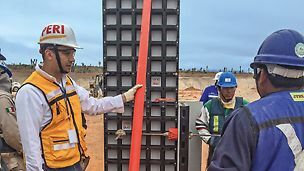 Before starting the work, the construction team was trained by a PERI supervisor. 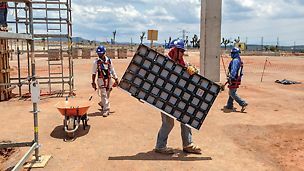 The training comprised an instruction in forming, cleaning and storage as well as safe working. Therefore, the use of the innovative system formwork was extremely efficient and quick right from the beginning. “Especially the low weight of the panels is of great benefit on the construction site, as work carried out by hand saves crane times and accelerates construction progress”, the project manager Ismael Gomez explains. Due to the instruction in assembly, cleaning and storage by the PERI supervisor, the construction team worked efficiently right from the start. DUO is a real hand-set formwork: the largest panel with 90 cm x 135 cm weighs less than 25 kg and can easily be carried by hand. DUO Multi Panels are used to realise reinforced concrete supports. 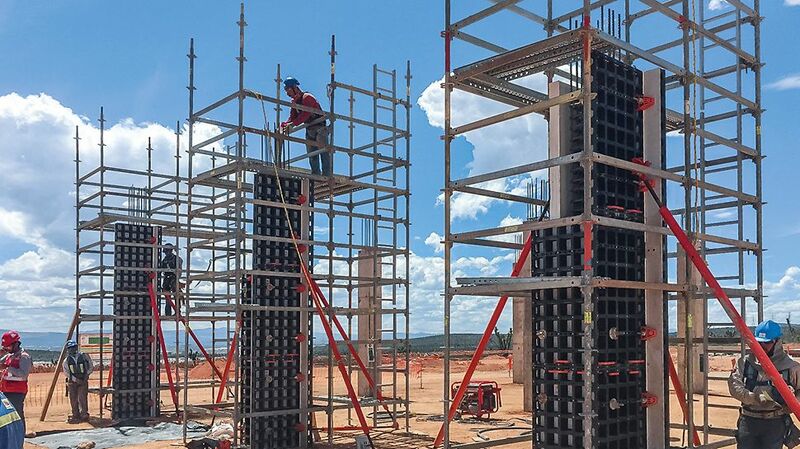 A circumferential PERI UP scaffold ensures safe working conditions.